Early this morning (Feb. 15), a meteor streaked across the sky above Russia's Ural Mountains. The fireball exploded, injuring more than a thousand people, creating a sonic boom and damaging hundreds of buildings, according to press reports. See photos of an apparent meteor that lit up the Russian sky on Feb. 15, 2013, and created a massive blast. 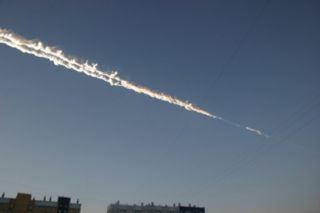 The Feb. 15, 2013 meteor blast over Chelyabinsk, Russia, damaged hundreds of buildings and injured more than 1,000 people. Here's what happened. Close encounters of extraterrestrial objects seen on and above Earth, coming from asteroids and meteors. A meteor crashes into the Urals in central Russia, injuring over 900 people, authorities say. Here are five incredible fireballs caught on video. A meteor that exploded over Russia earlier this month likely hit Earth after a long trip from beyond the orbit of Mars, scientists say. Russian Meteor Fallout: What to Do Next Time? Researchers and policymakers are ramping up efforts to detect and deflect asteroids. The unexpected impact has become the fastest growing video event on the Internet. Sped up for human ears, hear the largest infrasound blast ever detected by the world's nuclear-monitoring network. The meteor blast was stronger than nuclear explosions and detected from as far away as Antarctica. The Russian meteor explosion over Russia Friday (Feb. 15) is a clear example of why military satellite data on fireballs should be shared, scientists say. A group of Russian scientists has reported finding small meteorites from the fireball that exploded over the Chelyabinsk region in a blinding light, sending a shockwave that caused millions of dollars in damage in the city. The shock wave from Friday's (Feb. 15) meteor explosion above Russia sent subsonic waves through the atmosphere halfway around the world. The world will have to live with surprise asteroid attacks on the scale of Friday's Russian fireball, at least for a while, scientist say. The biggest meteor blast in a century is expected to kick off a booming market in rocks from space. The fireball that exploded over Russia Friday morning (Feb. 15) provided onlookers with an incredible spectacle, even outshining the sun for a brief period, scientists say. EUMETSAT's Meteosat-9 satellite captured imagery of the space rock over Russia in February 15th, 2013. What Is an Asteroid, a Meteor and a Meteorite? The terms asteroid, meteor, meteorite and meteoroid are explained. The U.S. House of Representative's Science, Space, and Technology Committee announced today (Feb. 15) it will hold a hearing in the coming weeks on how to deal with asteroids that pose a potential threat to Earth. A meteor explosion in the skies above Russia this morning also walloped the Earth, triggering shaking as strong as an earthquake, the U.S. Geological Survey (USGS) reports. The meteor explosion over Russia earlier today was captured by a space satellite in orbit around Earth. Over 900 people were injured, and 3000 buildings damaged on Friday, February 15th, 2013, when a meteor exploded above the central Russian city of Chelyabinsk, unleashing a shock wave that shattered panes of glass. The fireball that struck Russia today injuring more than 900 people is a glaring reminder that February is "fireball month." An unusually high number of meteors brighter than Venus can be seen this time of year. NASA asteroid expert Don Yeomans says it is clear this meteor explosion is not related to today's asteroid flyby. The meteor sent a shockwave that shattered window and damaged hundreds of buildings, Russian officials said. A meteor streaked across the sky in eastern Russia Friday (Feb. 15), unleashing a powerful blast that shattered windows, damaged buildings and may have caused injuries, according to Russian officials and news reports.